17% of cell owners say the best thing about their phone is that it is convenient. 12% like the ability to call or talk with others at any time. 11% like that their cell phone can help them get assistance in an emergency. 9% say that using the internet, email, or apps is the best thing about their mobile phone. 8% cite the ability to connect with family. 24% of cell owners say that the worst thing about cell ownership is that they are constantly available and can be reached at any time. 15% say that the cost of cell ownership is the thing they like least. 12% cite problems with bad reception, poor signal, or dropped calls. 8% cite problems with battery life as the thing they like the least. 8% point to interruptions from telemarketers and other unwanted callers as their primary annoyance. Overall, cell owners are far more likely to view their phone as a time-saver than as a time-waster. Some 33% of cell owners agree with the statement that their phone “saves you time because they can always access the information you need,” while just 3% agree with the statement that their phone “costs you time because you are constantly being distracted or interrupted.” The largest proportion of cell owners (56%) say that the time costs and time savings offered by cell phones pretty much balance each other out. Cell owners are extremely attached to their phones — although most don’t see that as too big of a problem. Mobile phone users see some drawbacks to cell ownership, but in general are positive about the benefits that mobile connectivity provides. 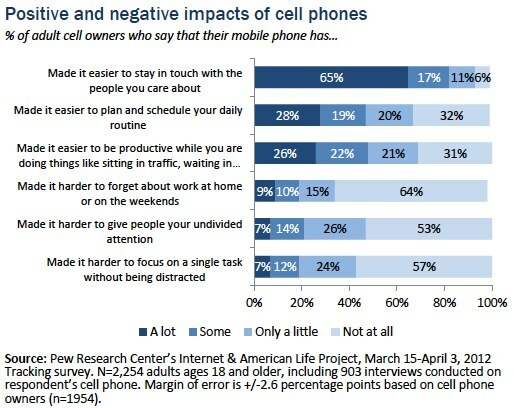 65% of cell owners say that their phone has made it “a lot” easier to stay in touch with the people they care about. 28% of cell owners say that their phone has made it “a lot” easier to plan and schedule their daily routine. 26% of cell owners say that their phone has made it “a lot” easier to be productive while doing things like sitting in traffic or waiting in line. 7% of cell owners say that their phone makes it “a lot” harder to give people their undivided attention. 7% of cell owners say that their phone makes it “a lot” harder to focus on a single task without being distracted. 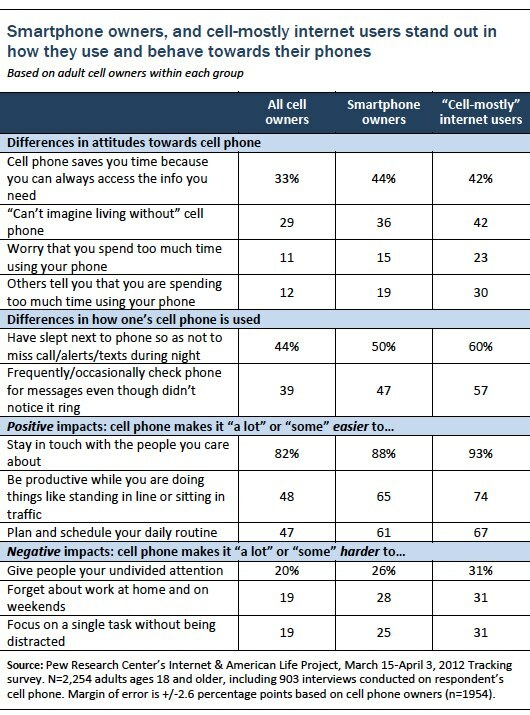 Smartphone owners and “cell-mostly” internet users show distinctly different usage patterns and attitudes towards their phones. When it comes to their attitudes compared with other types of cell owners, these groups are more positively inclined towards the benefits of mobile devices, but also more attuned to the potential downsides of ubiquitous mobility. They are more likely to say that their cell phone saves them time because they always have instant access to information, and more likely to say that they “can’t imagine living without” their cell phone. They also respond positively to the notion that their phone helps them be connected with others, schedule their lives, and be productive when they might not be otherwise. At the same time, these groups are also more likely to worry that they are spending too much time with their phone, to say that their phone makes it harder to focus on a single task without being distracted, or to say that their phone makes it harder to give people their undivided attention. To be sure, both smartphone owners and cell-mostly users share certain demographic characteristics that are correlated with mobile attitudes and usage patterns. For example, young adults are heavily represented in both the smartphone and cell-mostly populations — and as we will see throughout this report, younger cell owners differ from their elders in a number of ways. However, both smartphone ownership and “cell-mostly” usage each show a strong impact on a range of attitudes and behaviors even after we control for other demographic factors, such as age, income, education, or gender. Lack of need is the main factor preventing non-adopters from purchasing a cell phone; cost is the main factor preventing non-smartphone owners from upgrading to a more advanced device. Some 15% of adults do not own a cell phone at all, and a significant number of these non-adopters indicate that they are quite comfortable living without a cell phone. 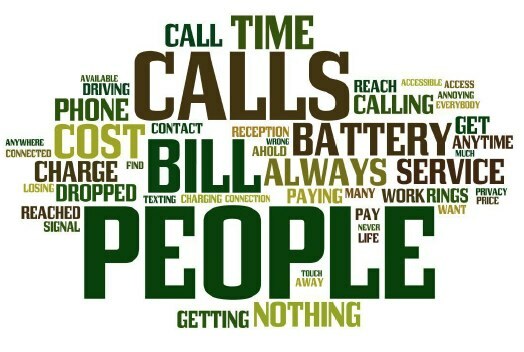 When asked for the main reason why they do not have a cell phone, 38% of these non-adopters say that they don’t need a cell phone or are happy with their existing landline service, while 11% say that they simply do not like cell phones or aren’t interested in purchasing one. However, one in five non-adopters say that cost is the main reason why they do not own a cell phone. For the 40% of adults who own a cell phone but have not yet upgraded to a smartphone, economic factors play a more significant role. Some 37% of non-smartphone owners cite cost as their main barrier to adoption, although 29% indicate that they have refrained from upgrading because they “don’t need” a more advanced phone. Digital skills and technical literacy issues also play a role in whether or not someone purchases a smartphone, as 9% of non-smartphone users say that they have not upgraded because smartphones are too complicated and/or they don’t know how to use them. 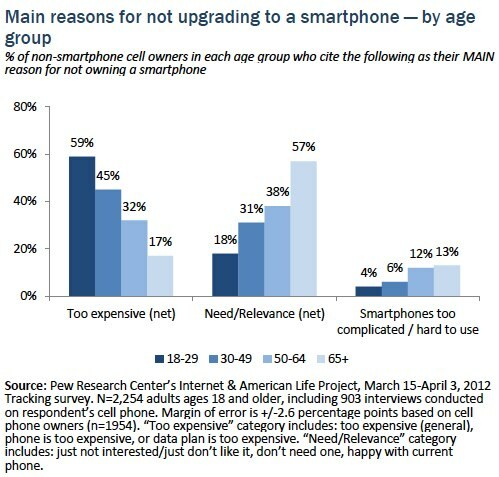 The reasons people give for not upgrading to a smartphone vary substantially by age. Younger non-adopters are much more likely than older ones to say that cost is the main factor preventing them from purchasing a smartphone, while older non-adopters are more likely to point towards a lack of need or interest, or towards challenges with using a more advanced device. The results reported here come from a nationwide survey of 2,254 adults (age 18 and older) between March 15-April 3, 2012, including interviews on landline and cell phones and conducted in English and Spanish. The overall sample has a margin of error of plus or minus 2.4 percentage points. Some 1,954 cell users were interviewed in this sample and many of the results published here involve that subset of users. The margin of error for data involving cell users is plus or minus 2.6 percentage points. General ownership figures for cell phones and smartphones come from a nationwide survey of 3,014 adults (age 18 and older) between August 7-September 6, 2012, including interviews on landline and cell phones and conducted in English and Spanish.